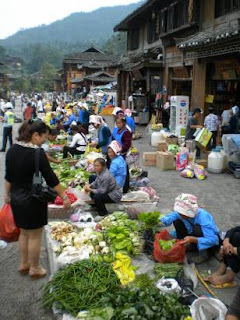 Miao Village market day in China. I could live there. This is it! The big weekend where you can come out with me to the Earth Day Market in Yoyogi Park. Just beyond the Rockabilly Dancers and whatever festival may be underway that day, you'll find some of the best organic and fair trade stuff around. Everything from fresh seasonal fruits and vegetables to jams to beer to wine to rice to tea to bread to cheese to cool handmade clothes to spicy curry. If you can't make it I'll be sad, of course, but you should then head on out to the other markets happening. Too much fun to be had not to do it! *Send along a comment here with your email (I'll keep it top-secret!) to let me know if you wish to join.